I love meals with little to no clean up at all when we are busy in the summer with other activities. 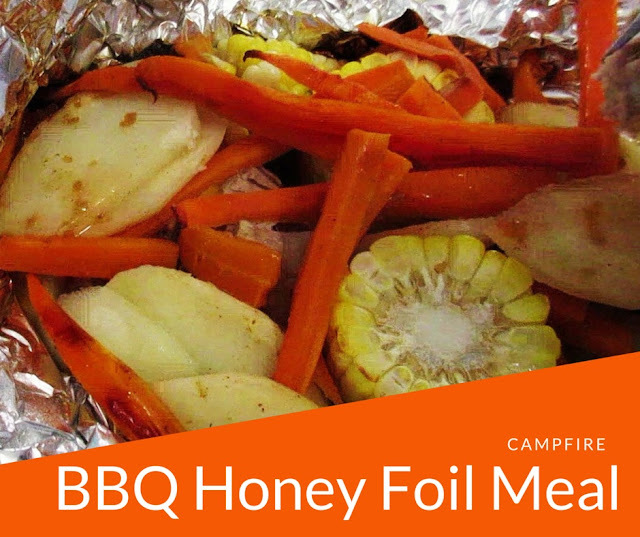 Foil meals are perfect for making ahead of time and putting them on the grill or the campfire when you are ready to eat. I love that you can open the foil pack and eat your dinner without messing with plates. Such an easy clean up. This week I used a pork loin roast from Shopease Foods cut it into smaller pieces to go into the foil packs. I find with this recipe you could also put in chicken, pork chops, and even a hamburger pattie. 1. Heat gas grill or get campfire started. Mix together BBQ sauce and Honey and set aside. 2. Spray tin foil with cooking spray. 3. Fill with meat, potatoes, carrots and corn on the cob top with 3 Tbsp of sauce. 4. Close foil up and seal edges. 5. Cook at medium heat for 20 to 30 minutes depending on cut of meat. Do you go camping or to the trailer in the summer? Do you have a favorite meal you cook on the campfire?